EATON — Members of VFW Post 8066 presented the 4-H Advisory Committee with a check in the amount of $300 on Tuesday, Sept. 18. According to Catherine Wilson, representing the Advisory Committee, the money will be used to pay for the 4-H Banquet to be held on Monday, Sept. 24. “This money is going to go to providing chicken for the entire banquet. The 4-H banquet is basically for the kids who showed during the summertime. It is basically their Oscars, where we recognize all that they did and everything they accomplished. It is a big deal for them, because it is once a year and is kind of icing on the cake,” Wilson said. Wilson sent a request letter to the post, asking for donations. Usually, they try to see if local companies or businesses are willing to help sponsor the event. “[Support from the community] is important, because we should work together. There may be a time when we’re able to help out the VFW. It goes back and forth, I think. As a community we need to help and support each other,” Wilson said. 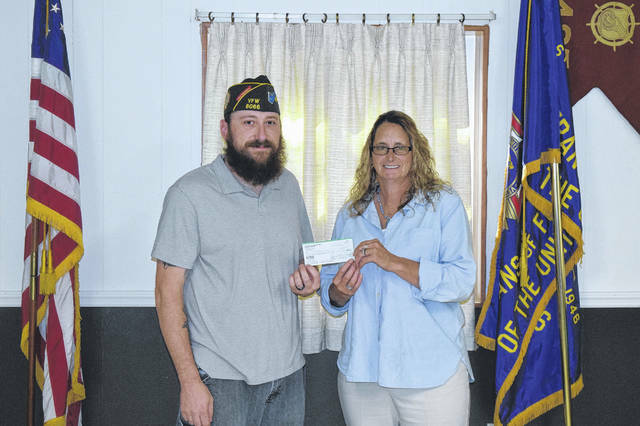 As for the VFW, officials say they try to donate to as many organizations and charities as they can throughout the year, knowing how important community support is.